Eleanor was born in 1122 and died 1st April 1204. She was the daughter of William X, Duke of Aquitaine and Aenor de Chatellerault. She married Louis VII of France. The marriage was annulled in 1152 and she married Henry Plantagenet. 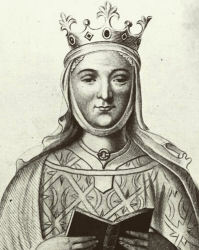 She was the mother of King Richard I and King John.